Our best selling bike. Designed for commuting, travel, and storage. Handmade in London. Clever Cycles is a Brompton Premier Store, the highest status awarded to a Brompton dealer. At any given time, we have around a hundred of the most popular configurations, ready to ship for a faster lead time. Your Brompton folding bike will be professionally assembled and packaged for safe transport. Our stock selection is available immediately at our Portland Oregon store. Portability is at the heart of this iconic brand. An ingenious design sets the Brompton apart from other folding bikes. People who have them love them. We’ve put thousands of miles on Bromptons. We’ve tested the products and can answer any questions you have about compatibility, use, and durability. We're the largest Brompton dealer on the West Coast, and we’re here to help you. The ultimate commuter bike. The most practical folding bike on the planet. You can take them on public transportation and inside buildings for safe storing. They can be transported in cars and most airplane overhead bins, eliminating the need for costly car racks and extra travel fees. They free you from transit routes and schedules, saving you time and money. They adjust to fit riders of all sizes. They're fast and easy to fold—they're the most compact and portable folding bike we sell. They're designed to keep dirt and grease off your clothes. They free up valuable space in your home or garage. Proven tough enough for decades of daily use. Small wheels and responsive handling offer fast acceleration and better maneuverability around road obstacles. Brompton owners have more opportunities to ride! Bromptons fold down to a portable 23 inch x 22.2 inch x 10.6 inch size. They can be easily carried and stored almost anywhere. Brompton brazes all their steel frame parts to increase durability, and every bike comes with efficient, puncture-resistant tires. The ride quality is exceptional! Keep in mind, any in stock Brompton can be modified. If a bike is shown with a Brooks saddle and telescopic seatpost, that doesn’t mean you can’t get it with a plastic saddle and standard post at an adjusted price. We modify bikes for our customers every day. Our stock changes daily. So if you don’t see it today, we might have it tomorrow or next week. Contact us and let us know what you’re looking for. If you would like to customize a Brompton beyond the modifications we can make to the bikes we have in stock, you can! Build a custom Brompton to your specifications with everything you want using our Brompton Customization Tool. Year after year they outsell all our other bikes. Brompton folding bikes have been hand built in London since 1975. Renowned for their toughness and agility, they’re the ultimate commuter bike. High build quality and decades of refinement means you can ride your Brompton on a regular basis for many years. Brompton’s ingenious design uses the seatpost to lock the folded bike together in a compact package that is easily carried or towed, and the chain and gears are located in the center of the folded package, ensuring no grease gets on your clothes. 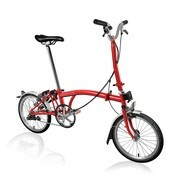 Brompton hits the sweet spot for folding bikes: exceptional ride quality, easy folding and compact size. Brompton’s commitment to quality and ingenuity is a big reason they’re the largest bicycle manufacturer in the U.K.
Brompton brazes all their steel frame parts, a process that produces a light but durable frame. Bromptons accelerate quickly and have increased maneuverability because of their small, 16-inch wheels, which are lighter and stronger than the larger, longer-spoked wheels of a conventional bicycle. Brompton’s high-pressure tires are efficient and puncture-resistant, and the actual rolling resistance is similar to that of large wheels. There are 1,200 parts on a Brompton, many of which are bespoke. The dimensions of a Brompton, folded, are 23 inches high x 22.2 inches long x 10.6 inches wide (585 mm x 565 mm x 270 mm), about the size of a carry-on suitcase. This measurement is based on a bike with folding pedals and a standard seat pillar and saddle. Measurements will vary slightly by model. Bromptons weigh 20 to 28 pounds, depending on the model and configuration. A Brompton bike can be folded or unfolded in under 20 seconds. Every bike comes with a five year warranty on the frame. While ordering a Brompton folding bike can be as simple as the click of a mouse, there are a myriad of ways to customize the bike’s components, and you might prefer to do research. To help with that process, we have bikes available for test rides, a friendly staff with specialized knowledge, and an online buying guide. You can purchase a bike we already have in stock, or use the Brompton Customization Tool to create a custom Brompton bike, choosing everything from color and frame material to handlebar height/style, gearing and lighting. If you’re not familiar with your options, you can play around with the Brompton Customization Tool first, then take a look at our Standard Bromptons to see if we have something similar. We are available seven days a week by phone or email if you have any questions. We’ve been selling Brompton folding bikes since 2007. At any given time we have around a hundred in stock and ready to ship (most with six speeds and mudguards), as well as parts and accessories to equip your new bike. We stock the full range of Brompton folding bike spares and accessories, plus third party add-ons for the Brompton enthusiast. As Brompton experts, we can answer all your questions about parts and modifications. If this is your first Brompton bike, we can guide you through every step of the process. If you’re adding another Brompton to your family, we can re-familiarize you with the Brompton product and walk you through any updates since we last talked. We’ve been saving our customers valuable time since 2007. Standard Bromptons come with standard seat posts, but other options are available. The standard seatpost is suitable for riders with an inside leg measurement of at least 66 cm or 26 inches and equal to or less than 83 cm or 33 inches. The extended seatpost can be extended 6 cm or 2.5 inches higher than the standard seatpost and is suitable for riders with a maximum inside leg measurement of 89 cm or 35 inches. A telescopic seatpost is also available. The telescopic seatpost is suitable for riders with a maximum inside leg measurement of 99 cm or 39 inches and for taller riders who want to minimize the height of the folded bicycle. The saddle can be moved back or forth within a 10 cm or 4 inch range. Standard Bromptons come with a standard width Brompton saddle in black, but other options are available. If you decide to buy a Standard Brompton, we can swap out seatpost length, suspension block and saddles with limited or no additional cost. If you’d like to raise or lower the gearing to suit where you’ll be riding most often, or you’d like to add a rear rack or generator lighting, we’d be happy to! Certain modifications, such as changing the number of speeds or handlebar height/style, are beyond a quick modification and may involve considerable cost. Please let us know what you are thinking, and we’ll let you know if it is possible along with the cost. If we don’t have a Brompton bike in stock that matches your need or preference, we can get you the exact Brompton you want, direct from the factory. Ordering a custom Brompton has never been easier. Our Brompton Customization Tool allows you to build a custom Brompton folding bike. In addition to Brompton’s factory options, there are supplemental gearing, lighting and luggage, as well as some very slick Brompton accessories. Why Buy a Brompton Folding Bike From Clever Cycles? We love Brompton folding bikes and it shows. On any given day, we have at least one Brompton in a workstand getting tuned up, several on the floor and in the store window, and more than a dozen designated rentals. With close to a hundred Brompton bikes in stock at all times, there’s plenty of options to choose from, and our impressive inventory is replenished several times a month with regular shipments from the Brompton factory. Every Brompton bike is inspected, assembled, tuned and test ridden. If we are shipping the bike to you, the bike is professionally packaged for transport to protect it from damage. If you’re local, we’ll make sure your Brompton is running smoothly after its break-in period with a free safety tune-up. Financing is available if you’d like to spread out your payments over a few months or even a year. We stock a wide range of accessories for the Brompton folding bicycle: Ti Parts Workshop, Carradice, B&W cases, Ergon grips, Busch & Muller lighting, Schwalbe tires and Abus locks are just a few. We would be happy to make recommendations on which Brompton accessories you might want to add to your purchase. We use the products we sell and only stock items that have proven functional with the Brompton and its folding capabilities. Brompton has a great selection of bags for their bikes—more so than any other bike manufacturer we’ve seen. They’ve even designed a special Brompton toolkit that fits inside the frame and has the tool you’ll need to make a repair while on the road. All Brompton folding bike accessories are high quality and form a complete system. The versatile Brompton H6L has 6 speeds, H type handlebars, and mudguards. The Brompton S6R has 6 speeds, sporty S type handlebars, mudguards, and a rear rack. 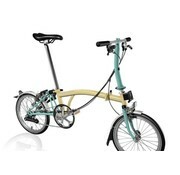 The lightweight Brompton S2L has 2 speeds, sporty S type handlebars, and mudguards. The lightweight Brompton S2R has 2 speeds, S type handlebars, mudguards, and a rear rack. 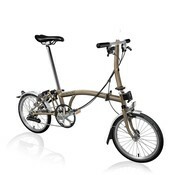 The robust Brompton S3L has 3 speeds, sporty S type handlebars, and mudguards.